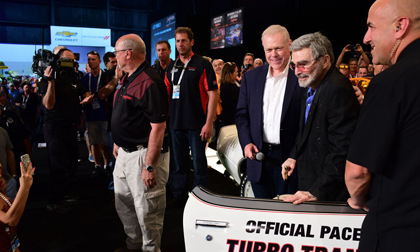 PALM BEACH, Fla. – April 16, 2018 – Barrett-Jackson, The World’s Greatest Collector Car Auctions®, was a star-studded event that featured celebrity guests from across the entertainment and sports industries, record attendance, record auction sales and the largest number of registered bidders for any Palm Beach auction. Three impressive collections were sold at the 16th annual auction, highlighted by renowned collector and philanthropist John Staluppi’s highly coveted Cars of Dreams vehicles, which all sold at No Reserve. At the beginning of the week, Barrett-Jackson kicked off its 16th Annual Palm Beach Auction with a special parade featuring vehicles from John Staluppi’s Cars of Dreams Collection. During the four-day auction, 145 vehicles from the collection sold for $13.96 million. Several auction sale world records were also set by vehicles from the Cars of Dreams Collection including “Herbie”, a 1963 Volkswagen Beetle (Lot #703) that sold for $128,700; a 1970 Superbird (Lot #708), which sold for $286,000; a 1959 Desoto Adventurer Convertible (Lot #718.1), which sold for $330,000; and a 1966 Ford Good Humor Truck (Lot #392.1) that sold for $117,700. Barrett-Jackson also continued raising funds and awareness for deserving charities with the sale of a 2006 Ferrari F430 Spider (Lot #3000) previously owned by Zac Brown Band fiddler Jimmy De Martini. With De Martini on the auction block, the Ferrari sold on Friday for $250,000, with 100 percent of the hammer price benefiting Camp Southern Ground. On Saturday, the 35th Anniversary Corvette (Lot #3001), which raised $350,000 in Scottsdale, sold again for $180,000 to benefit the American Heart Association. Renowned philanthropists Jeanette and John Staluppi were the winning bidders, and generously donated the Corvette back to be sold at a future auction. To date, the Corvette has helped raise $550,000 as part of Barrett-Jackson’s yearlong Driven Hearts charity initiative. Barrett-Jackson’s Northeast Auction will be held June 20-23, 2018, at Mohegan Sun in Uncasville, Conn. For more information on becoming a bidder for the 2018 Northeast Auction, go to www.Barrett-Jackson.com/bid. To submit an application to consign at the 2018 Northeast Auction, click here.